We bought our house about 5 years ago. It had the old aluminum frame windows and sliding glass door. This year, we finally bit the bullet and had them replaced with Low-E vinyl windows. We also had our front door replaced at the same time because it was UGLY! It was painted badly (probably to sell the house) and the paint was peeling off in big strips. Although we got a fancy front door, it was really only a little more expensive than a regular front door. We decided to have everything installed by a professional so we didn't mess anything up. I'm so glad we did! There were the standard problems you might run into, one window was ordered at the wrong size, the new doorknob was broken, bees nest discovered living in our siding. I was glad not to have to deal with any of these little irritations. But the real payoff came when they removed the sliding patio door. There was a puddle of disintegrating particleboard and water under the door. The workmen were able to remove most of the damaged particleboard, we dried it out for a few hours with a fan and they installed the new door. Luckily the subfloor was still intact but it would not have remained that way if we had waited much longer to have the door replaced. 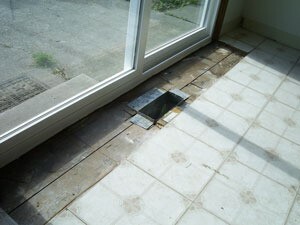 As it is, we have had to move up our plans to redo the kitchen floor. Then the next snag was discovered on day two. 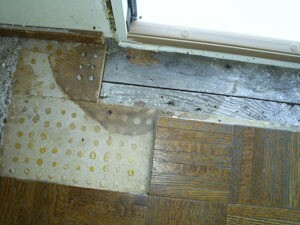 There was a similar spongy particleboard mess under the front door. He could take his finger and scoop it right out. Both conditions were caused by poor original construction and exacerbated by the old and leaking doors (I hadn't noticed any leaking, mind you). So, we have to redo the entryway flooring too! You can see the water stain where we still need to remove particleboard. Also, carpenter ants started filing out of the hole. They were living on the wet particleboard! Although this is going to cost us a bit more than we expected, I am so glad that we didn't try to tackle these installations on our own. I'm also so grateful to the workmen for pointing out the problems, fixing what they could and explaining exactly what we need to do to fix the rest. They even advised us on house painting (our siding needs some help), mildew problems and some drainage issues. We have some work ahead of us but at least we know what is most important to fix first! Thank you so very much. I am happy you decided to share your experiences with us, especially with pictures. This is very helpful for those of us just waiting for the fun of fixing up. A good reason for using pros, and taking it easy on DIY. It also may prompt some of us to take care of problems sooner, instead of waiting for the fun of finding "wood pudding." Your front door is lovely! 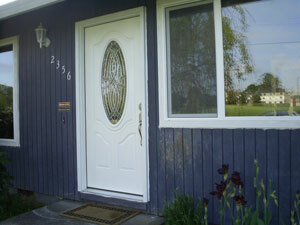 Isn't it nice to replace these outer doors with something new? I recently replaced my old sliding glass patio door (and I mean OLD!) with beautiful outswinging french doors with the built in blinds. It made a world of difference in the way the whole room looks. I also had the professional installation done - it cost nearly as much as the door itself, but there's no way I would have tried to tackle that chore of tearing out an old door like the one we had! Thanks for the feedback. I've been getting compliments from many of my neighbors too. The old door was simply terrible, I wish I had a picture. Then again, it is best forgotten.